Lindéngruppen has donated SEK 200,000 (€20,000) to help Doctors Without Borders tackle the refugee crisis in Europe and the Middle East. The money will be used to provide medical and humanitarian assistance to refugees seeking sanctuary in Southern Europe, large numbers of whom are fleeing conflict zones in countries such as Syria and North African states. Doctors Without Borders operates projects in 60 countries, including Syria and neighbouring states, Saharan Africa, Serbia, Greece and Italy. Katharina Ervanius of Doctors Without Borders said donations from companies and private individuals played a critical role in enabling the aid organisation to help and care for people in acute need. "The people who are risking their lives in the Mediterranean as we speak are involved in one of the worst humanitarian crises of our lifetime. 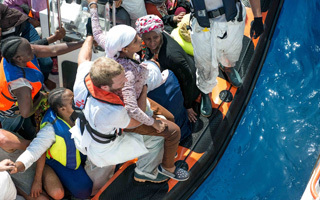 More than 3,500 men, women and children died trying to reach Europe last year. This is appalling and unacceptable," she said. Ervanius stressed that more people than ever had been reported dead or missing in the area during the first three months of 2015. Doctors Without Borders is committed through a local presence to helping people fleeing the conflicts in Syria and North Africa. Ervanius expressed thanks to private sector donors, saying their funding to Doctors Without Borders was playing a valuable role in helping to manage the crisis. "Companies and individuals that communicate their support for a specific issue or organisation inspire others to do likewise, which is incredibly positive. Businesses have a key role to play in society at local and global level, and it is heartening to see more and more companies understanding that." Lindéngruppen chairman Jenny Lindén Urnes said: "We have been supporting Doctors without Borders for several years, but felt compelled to increase our contribution given the scale of this humanitarian crisis." Doctors Without Borders is calling on European Union states to create safe corridors and "dignified reception conditions" for people fleeing armed conflict in their home nations. The organisation wants asylum seekers to be given legal opportunities to cross international land and sea borders so they can seek sanctuary in the EU. Ervanius said: "An effective method to move asylum seekers from one EU state to another must be found. Access to a unified asylum process and support must be available at the point of entry – across Europe and along migration routes."